Anyway, as it happens, it’s Frank Miller’s birthday — he’s now 62 — and just the other day DC Collectibles announced a number of new Dark Knight Returns items that should interest long-time fans. They’re not toys, but they are work a look. Check ’em out, complete with their official solicitation descriptions below. Oh, and for our full Frank Miller birthday celebration — spotlighting DKR — click here. The DC Gallery collection presents reproductions of some of the most iconic props and art from across the DC Universe. For the latest release, the team has launched a collection of Batman cowls, each representing a beloved rendition of the Dark Knight’s headgear from comics, games and much more. The latest piece in the series comes from the 1986 classic BATMAN: THE DARK KNIGHT RETURNS. The cowl design is based on Frank Miller’s illustrations of an aging Batman; the mask is set to showcase a wider, tired and grimaced face. The design was already iconic then, and its influence has since been seen in comics, games and movies alike. Long retired due to age and a changing world, an elder Batman makes his homecoming to the crime-ridden streets of Gotham City in the seminal BATMAN: THE DARK KNIGHT RETURNS by Frank Miller. 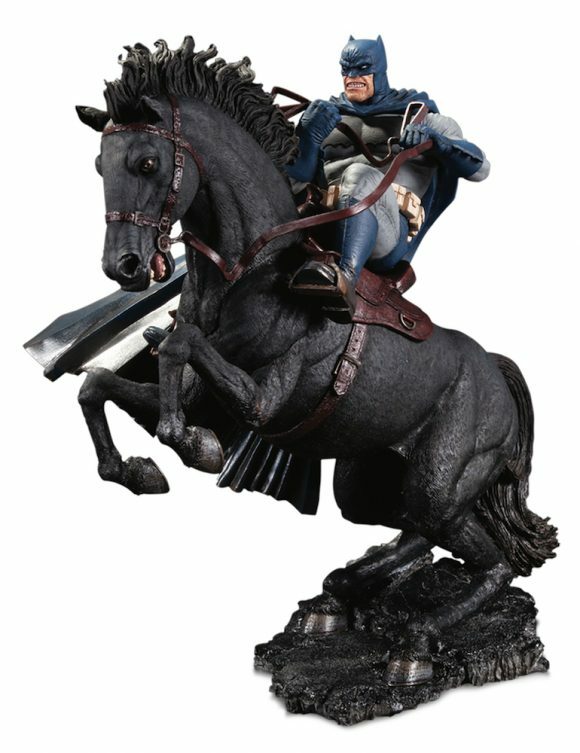 In this epic statue crafted from the art of the book, Batman leads the charge against a new foe, mounted atop a horse as dark as night. 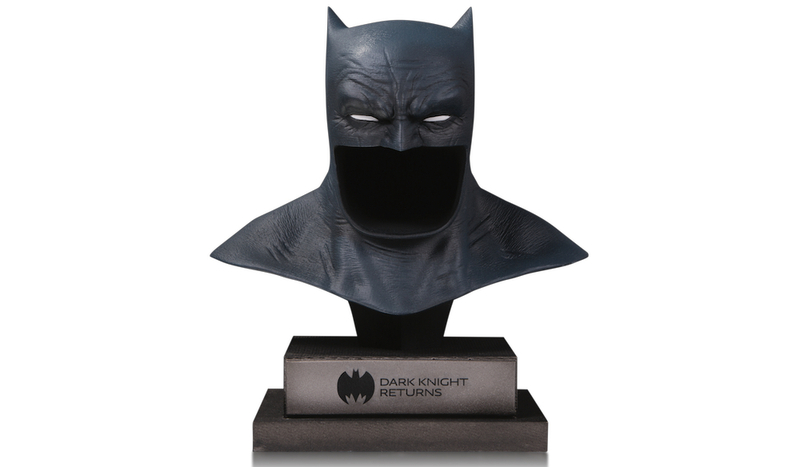 This high-quality mini-statue is made from polyresin, giving a rich depth of detail to both Batman and hias steed. This is a must-have for fans of Batman and the Miller classic. Batman and Superman are longtime allies and founding members of the Justice League, but sometimes rifts emerge and they find themselves on opposite sides. Of these showdowns, there is none more iconic than the one from the seminal BATMAN: THE DARK KNIGHT RETURNS by the legendary Frank Miller, where an aging and heavily armored Dark Knight faces down a reluctant Man of Steel. 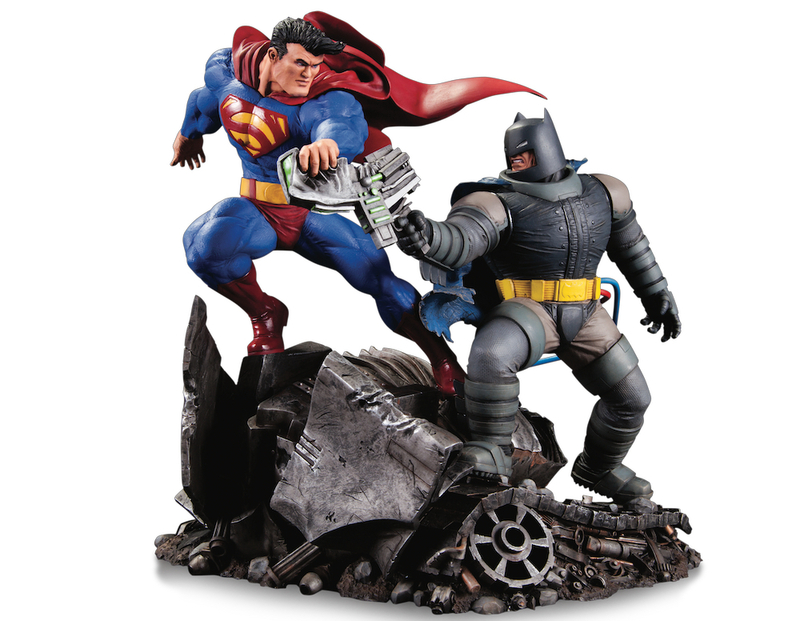 Cast in high-quality polyresin to fully re-create this beloved clash, this ministatue will be a great addition to the collection of any Superman, Batman or DC Comics fan.